If you want to take a fast track nursing program, you may be asking yourself how long it takes to get an accelerated nursing degree. This is a relevant question that you should gain insight to before you select an accelerated program over a less intensive traditional program. 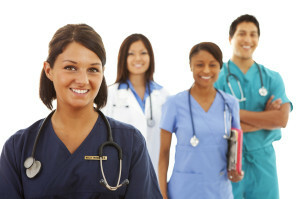 Fast track nursing programs are becoming increasingly popular as the demand for nursing professionals grows and more prospective students have a need to earn their degrees quickly. While accelerated programs are not for everyone, for students who are motivated to enter the nursing field as quickly as possible they can be very beneficial. Read on, and learn about accelerated timelines and other information you should know about taking the fast track. Not everyone is lucky enough to know their future career goals while they are studying to earn their associate’s or bachelor’s degree. If you took the time to earn an undergraduate degree, but the degree does not pertain to the field of nursing, you can earn second nursing degree in an accelerated program, if you have decide to change careers. This can help you enter the field of nursing without having to spend several more years in school. An accelerated second degree program typically takes 12 months to complete. To enter this type of program, you must already possess a bachelor’s level degree from an accredited school. It does not matter what field you majored in as long as your bachelor’s degree is from an institution that has a regional accreditation. The 12 month program can be completed quickly, because you will take only courses that pertain to nursing. All of your other courses will be applied so that you meet requirements to test for your nursing license. Accelerated programs are not for everyone and it is important to realize just what you are committing to before you make the commitment. Accelerated programs move at a very fast pace. Since there is so much material to cover in a limited amount of time, you will need to have a flexible schedule where your schooling can be made a priority. If you cannot focus at least 40 to 45 hours of your week on school, an accelerated program is probably not the right option to get the knowledge and the skills that you need. If you think that you are a great match for the accelerated BSN program, make sure that you have all of the classes that you need completed. Even if you have a BA or a BS, it is possible to be lacking some of the prerequisites that a majority of BSN programs want you to have completed. Most programs require you to have completed the following: anatomy, statistics, physiology, chemistry, human growth and development, and psychology. If you do not have these completed, it could affect your chances of being accepted. It is very important to compare programs before you choose one. You should be sure that any program you are considering is accredited by the American Association of Colleges of Nursing. By doing this, you can take the quickest route to licensure without having to worry about how your degree will be perceived. Now that you have the answers to the question: “How long does it take to earn an accelerated nursing degree?”, you can start mapping out the route that you will take.